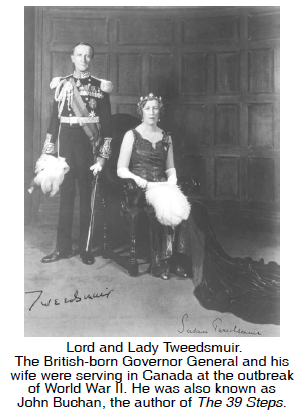 The Governor General is the Crown's representative in Canada. This is largely a ceremonial office which acts symbolically. The Governor General officially gives Royal Assent to a bill to make it law, summons Parliament to meet, and formally appoints the Cabinet on the recommendations of the Prime Minister. The Governor General exercises all these functions routinely and would not ever likely go against the wishes of the elected Prime Minister, although once in our history, Governor General Julian Byng did not follow Prime Minister Mackenzie King's advice and triggered a constitutional crisis in 1926 called the King-Byng affair. The first Canadian-born Governor General was Vincent Massey, appointed in 1952. Before that they had all been British and generally from the aristocratic class. The first woman to hold the position was Jeanne Sauvé in 1984. In 1994 the first Acadian, Roméo LeBlanc, was appointed to the position and in 1999 Adrienne Clarkson became the first immigrant in the job, followed by Michaëlle Jean, a refuge from Haiti, in 2005. In 2010 David Johnston, an academic, became Governor General.